This story is from when I was a college student. Thinking about the future can terrify more than one. Back in January, I started looking on the web for public relation agencies within the United States to do an internship. I saw myself kind of frustrated because I’m really close to graduation and I want to get as much experience as I can so I’m not someone with nothing bringing to the table. I sent my resume to several companies. One of them was Newlink Communications with headquarters in Miami, FL. I did my research on this one and looked up its website, its clients, etc. Just like any other job I’ve applied to, I expected to get an email right away saying, “Thank you for your application and yada yada yada…” I got it, but one week later I got a personalized email saying that they wanted to go through the process with me and asked me to write two essays: one in Spanish and one in English. I wrote what I was requested and sent my “assignment” back to them. After this, I had three interviews in three months. Not going to lie, I was getting a little frustrated because I thought it wasn’t going anywhere. I had my third interview with a Puerto Rican girl, maybe in her 30’s. She was very young and funny. I remember we laughed several times and I thought she wanted to hire me. Because of the weird track system that the university I go has, I had to push a little on that last interview. I told them that I needed to know if I was going to make it or not because I needed to work things out with the school, with my contract at the apartment complex and have everything ready to go for my last semester. The Puerto Rican girl told me they were going to make a decision and that someone would call me by EOB. While I was getting ready to go to Denver with my roommates, I got the call: “Ober Delgado, congratulations you have been selected as one of our Summer Interns.” I was very excited and I knew that I was going to have many challenges. That same moment I called the school, the registration office, the financial aid office, the apartment complex where I lived, everywhere! to cancel everything because I was going to sunny Miami. I knew from January that this was an unpaid internship, but I didn’t care about that, because I wanted to get hands-on experience at a real public relations agency. I got a student loan and long story short I was ready to go to Miami. I hopped on my 2004 Chevy Cavalier and started my journey. 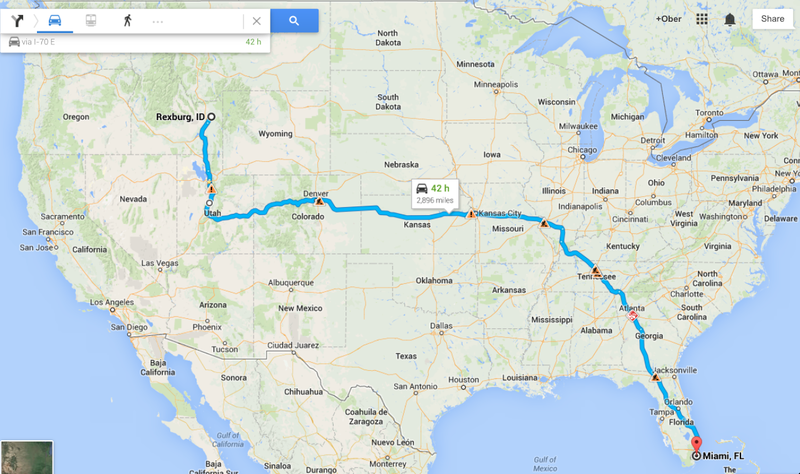 I drove for six days, more than 40 hours, and almost 3,000 miles. It was quite the adventure. I contacted all of my Facebook friends seeking for places where to sleep on my way to Miami. I drove from Idaho to Salt Lake City, Utah where I spent the weekend. Then to Fort Collins, Colorado. After this, to Lawrence, Kansas. Then to Marrieta, Georgia. The next stop was Orlando, Florida and finally to Miami. When I went there, everyone had already heard about me. Haha It was like a celebrity just stepped in. It was awesome! From that very moment I knew I was going to have a great experience. It was the energy and the culture that I liked the most. Yazmine was waving at me from another office. She raised her two arms with excitement and I was like, “this is such a great welcoming” haha it was just awesome. I got to know Amy, also from the team, that very same day and now I just can’t imagine working somewhere else without these two amazing, talented and smart women. I have learned so much, SO MUCH at this internship. I have been exposed to clients and even the CEO. I’m not making coffee for my bosses or printing stuff. I’m doing the real thing. At school I heard about pitching, and all these terms you use in the public relations world, but you never learn until you actually do it. I have gained experience that will help me get a job faster after graduation. I have press releases that have been published through PR Newswire in hundreds of outlets in English and Spanish. I have connected with journalists, my tweets and my Facebook posts have been published, how an agency works, what activations are, and more. I recommend to any student to effectively seek for internships before graduation. It’s such a great advantage over others that don’t have the skills you’ll learn during that time. Update: After the Summer internship I was offered a Fall internship (this one was paid). Update: After the Summer and the Fall internship I was hired as an Account Coordinator. I work in the tourism/travel industry. 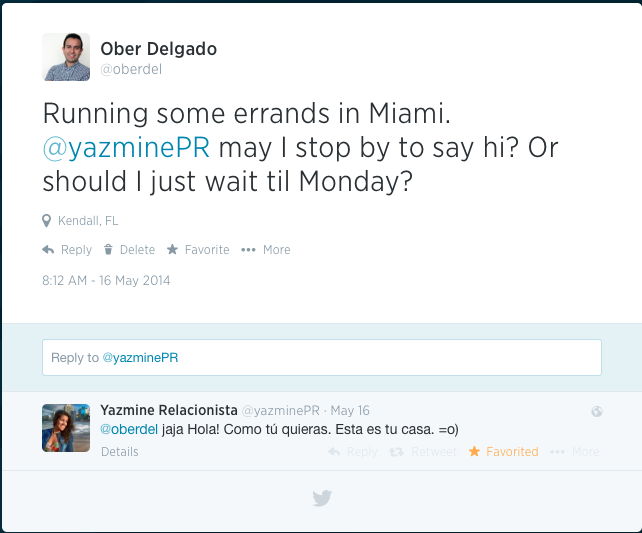 Next Post Why Making a List on Twitter is Important in Public Relations?